If how much you spend is the most important, get the $199 Kindle Fire HD or Nexus 7. If how much you spend is really, really important, get the last-generation Kindle Fire for $159. If the most important thing is using all your iOS apps, get the iPad mini. 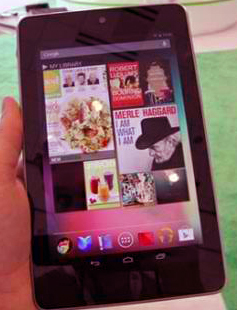 If the most important thing is using all your Android apps, get the Nexus 7. If you want the freedom to run apps that Apple might not approve of, get the Nexus 7. If you're an avid Amazon customer and want all the benefits of Amazon Prime, free videos, and the ability to "borrow" Kindle books, get a Kindle Fire HD. If you think you'll be infuriated when Apple introduces a better iPad mini for the same price and drops the price on this one, don't get the iPad mini right now. If you want the most mainstream option, with better app security, and you don't mind spending extra for the privilege, get the iPad mini. If you've never used a tablet or a tablet operating system and you want access to the most training resources and materials, get the iPad mini. If you want to read magazines and books in the bathroom and don't want to freak out if you drop your tablet in the toilet, get the last-generation Kindle Fire. For me price and the ability to run all Android apps was the most important feature. Ann surfs the web, does email and reads books using the Kindle and Nook apps. Let me know if this helps and how you are leaning tablet-wise.